At this time of year churches throughout the country hold services to remember and celebrate the lives of those who have died. At St Stephen’s it is an opportunity to bring the community together in an uplifting service of Remembrance where the families have asked for the names of their loved ones to be read out. At the service they are also invited to light a candle in their memory. Despite being a sad occasion to many, it is also an opportunity to celebrate the gift of life and the treasured memories that comfort us during times of grief. At Lodge Brothers, we like to support our families after the funeral, sometimes at a time when the harsh reality of the loss can really set in. We also like to remember that arranging a funeral is also about acknowledging the life and the contribution that life had on all those who they loved. 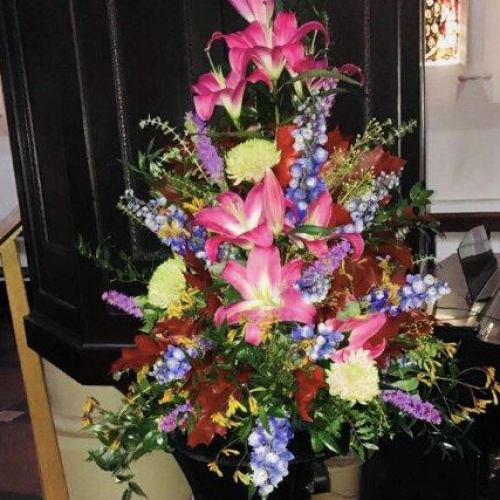 It was a fitting tribute that Lodge Brothers asked a local florist, who were able to work with the church, to create a vibrant and colourful display to represent this.